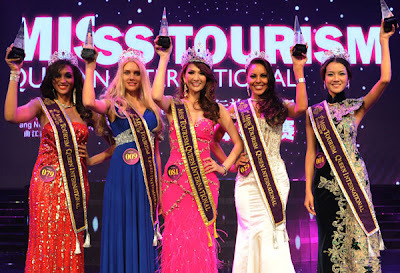 Miss Thailand, Kantapat Peeradachainarin won the Miss Tourism Queen International 2011 title during a beauty contest held on December 29 at the Qujiang International Exhibition Center in Xi'an, China. Kantapat Peeradachainarin is a pageant veteran. She was the former Miss Friendship International 2009 winner and a semi-finalist in Miss International 2011. Miss Thailand will receive USD 20,000 in cash, a crown worth USD 20,000, plus several other prizes. She will spend her year traveling in China, Thailand, as well as other countries.